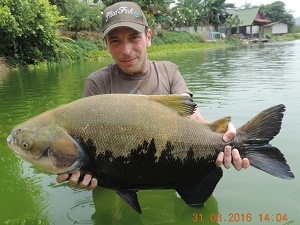 A short day trip saw Italian angler Gianluca fishing in Thailand at Palm Tree Lagoon. On arrival at the lake the angler soon had two rods fishing for carp and catfish with an additional rod fishing for predators. It was not long before Gianluca was into the first fish of the day on one of the carp set ups. 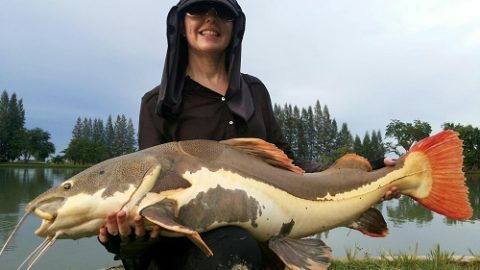 A small Giant Siamese carp of an estimated 20kg was duly landed after a short battle. Further action on the carp rods followed with some small striped catfish. After a quiet lull in action the predator rod was away and soon saw the angler slipping the net under a stunning Tambaqui of 10kg’s.